A piece of paradise is awaiting you in this private scenic setting between Sarasota and Ft. Myers. Our 2000 square foot 3 bedroom 2.5 bath beauty is situated on an amazing saltwater canal with gulf access through Charlotte Harbor. The magnificent home was built in 2003, with 12 foot ceilings, many upgrades and comes newly furnished. Enjoy beautiful sunrises overlooking the canal via the enclosed lanai or sit on your own private dock. Once finished with the morning sun, you can take a dip in the heated pool or spa. You can also try your hand at fishing in the canal. Then, head inside and enjoy your two splendid sitting areas both with their own plasma TV's and DVD players. Also, you can relax anywhere in the house while you use the wireless internet and surround sound system. The house comes complete with a master suite that includes a king bed, walk in closet, soaking tub and a marvelous Roman shower. There are also two other wonderful bedrooms that have queen beds. In the living areas, guests can also use the two queen sleeper sofas. We haven't forgotten those of you who enjoy a formal evening of wining and dining. Enjoy the fine dining area especially decorated for those splendid evenings. Or, you can relax and eat informally at the large eat-in area and bar in the kitchen. 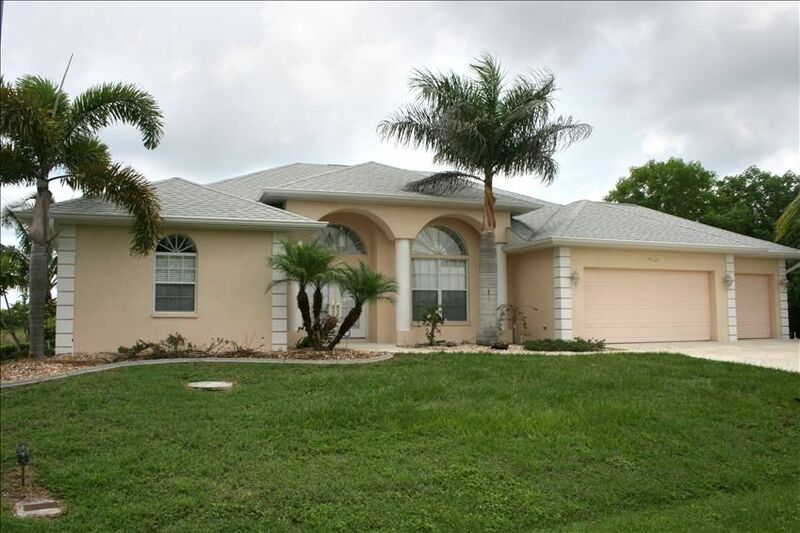 South Gulf Cove is conveniently located between Sarasota and Ft. Myers. It is only minutes to gorgeous white sand beaches that are full of numerous activities. Shelling, snorkeling, boating, beach combing and kayaking are some of the activities within minutes of your doorstep. The Cape Haze Peninsula is also home to the Tarpon and Snook capital of the world - Boca Grande - which is within a ten minute drive. There are numerous and wonderful eateries, golf courses (seven within five minutes) and shopping districts within a short drive. Central air conditioning, as well as weekly pool and lawn services are provided. Pool heating is provided with the rental rate in the winter months. The house comes equipped with an alarm system as well as an intercom system. The house is also accommodated with a laundry room. We are a group of friends who chose to purchase a property in one of our favorite destinations. South Gulf Cove is close enough to area amenities, but secluded enough to call "your private piece of paradise." Area amenities include great golfing, tennis, shopping, fine dining, entertainment and more are all close at hand. Residents also enjoy fun in the sun at nearby Englewood Beach or the secluded Boca Grande for swimming, shelling, sunning, picnics, jet skiing and all other outdoor activities. The Cape Haze Peninsula has some of the most pristine beaches that Florida has to offer - without the overcrowding. The Peninsula has no high rises, friendly locals, family owned restaurants and low traffic; this is "Old Florida." We decided to buy in the South Gulf Cove area because it is centrally located to the beaches, restaurants, golf courses and shopping. There are numerous activities within a 10-15 minute drive (7 golf courses, parks, beaches, shopping, arcades). South Gulf Cove is also a short drive to Sarasota and Ft. Myers; so you are never more than 30-45 minutes away from an airport. One of the main aspects of our property that we enjoy is the overall privacy you receive when at the property. With only one neighbor, you don't have to worry about noise or interruptions; but you can drive five miles and be at a grocery store/gas station/restaurant or fast food. Being on a gulf access canal, you can rent a boat and have access to the canals, rivers and the Gulf of Mexico. This area is known for being the Snook and Tarpon capital of the world - so make sure to bring your fishing gear! You can even fish right off the back of the property on your private dock. We have stocked the property for long and short stays. You don't have to worry about bringing linens, utensils or pool toys - they are all there for you. You can also sleep peacefully; we provide ADT security for the property. The pool and hot tub provide a wonderful place to escape and relax. You will find that you won't want to leave the property once you arrive! toilet, combination tub/shower, Bathroom is shared between the 2 queen bedrooms. My friends and I had an incredible week long stay at this property. The house was big enough for all of us, had many things for us to use and was very clean. It's a bit of a drive to anywhere but that's both a pro and a con. A pro because it was a quiet week back in a cute subdivision, but a con because it took us a while to get anywhere. The pool and lanai were beautiful, though the filter wasn't working the best. There is a lot to do in the area and everything is affordable. Everyone was very friendly and accommodating. I highly recommend this area and property for a family or group of friends! The house was spotless! Comfortable furniture and nicely stocked supplies. Wonderfully relaxing spa and pool. The only down side was the Red Tide that stopped us from going to the nearby beaches. Would definitely stay again. When we got there the pool was green the kids were a little disappointed. It took 3 days for it to clear up that was sad. The house itself was very nice. Thank you for the review. Unfortunately, the tenant who left the previous day didn’t inform me or the pool person of any issues. As soon as the cleaner told me of the issue, I called the pool guy to work on this. I apologize for the inconvenience. Wonderful house, lots of space for the 8 of us who stayed there. The private pool was awesome. Love the house wide sound system. Saw an alligator in the canal on our last night there! Would definitely stay again. The home was in perfect order with high quality furnishings, comfy furniture and very clean. The pool and view are phenomenal. The 1 neighbor was hardly noticed. Our family has travelled and stayed in many beautiful places, but this home is our new top pick. The location is close enough to some activities 4 those who wish to venture out more than we did. We simply chose not to miss any more time in the paradise found within the property itself. Communication with the owner was great. Amazing house that was everything we needed and more! From the moment we stepped inside the house, until we locked the front door behind us and left, we felt at home and taken care of. The house itself is beautifully laid out, with easy to use AC, huge kitchen, massive sliding doors, tons of sunlight, etc. Master bedroom is spectacular, with sliding doors leading poolside. The other bedrooms are great as well, with tons of space for clothing and some children's toys in the closet (which we quickly availed of). The pool is fantastic and there's a hot tub too! Easy to use heat/jet/waterfall controls made it enjoyable for hours of fun every day. There are two bathrooms in the house, and one outside by the pool, so you don't even have to walk inside when you need a restroom while swimming. The garage is stocked with not just pool toys, but lawn chairs and even fishing rods, because yes, this house is located on the canal with a cute private wharf. Also, there's a gas grill perfect for cooking up steaks and hot dogs by the pool. The neighborhood itself is very secluded and quiet, perfect for people looking to get away and relax. But it's just a short drive to all the amenities you'd need (food, gas, shopping, etc.) and there are some really fun restaurants close by. And of course, the beaches are just a short drive away as well. All in all this is an amazing rental and really added a lot to our trip - so much so that we are considering doing it all again!